Youve told us you want a paper thats easier to navigate. The redesigned Globe breaks into four sections. Stories that start on Page One will rarely, if ever, jump to another section. Weve organized the paper so that the news and features appear in the same place every day. 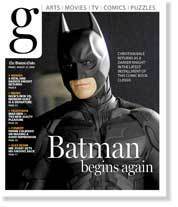 And were introducing "g" — a new magazine-style section focusing on arts, entertainment, culture, people, and lifestyles. Our new magazine-style section will be called g  for Globe  and it reflects what you, our readers, have been telling us about how you prefer to receive your reviews, previews, profiles and arts, culture and features coverage. You want to find stories of interest quickly and easily. You want it in a format that can be carried easily as you move about town  while on the train or on a lunch break. Every day, "g" will highlight things to do around town. On Wednesdays, the section will focus on food. On Thursdays, the section will focus on style. We've also expanded our critics' picks of the best things to do for the week. Complete listings are available at boston.com/thingstodo. On Fridays, the section will focus on the weekend: arts, movies, music, theater and other entertainment. All your favorite comics and a few new ones in color every day. TV listings have been color-coded to highlight movies, sports and news programming. We've kept your favorite puzzles and added a brainteaser, KenKen. The front page will continue to offer the full range of local, national, international, arts, entertainment, and sports stories our readers want from us, though clearly our focus is on Boston and stories that matter most to us here. The first section continues to be the place for top national and foreign news, as well as editorials and opinion. Look for more color throughout the news section. On the Nation and World pages, expanded news summaries will give you a panoramic and convenient way of staying up to date. On Mondays, look here for the Health|Science section. 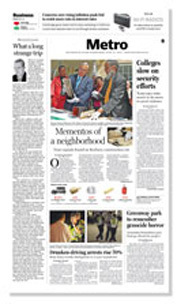 News from the city and region and obituaries appear Monday through Saturday in the newly expanded and renamed Metro section. The Business section, with about the same amount of news and information as before, appears inside Metro each day. Celebrity and entertainment news is featured in the Names column, routinely appearing in color on the back of this section. 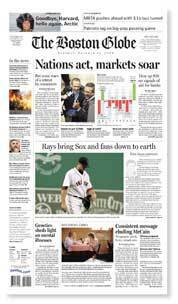 The sports section is the third section of the Globe each day, but with more color throughout. Weather anchors the back page of the Sports section Tuesday through Saturday. 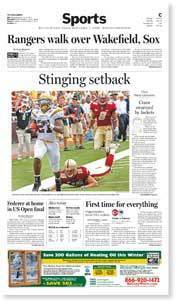 Your Sunday paper basically stays the same, with one exception. TV Week will no longer be available in the Sunday paper starting on Sunday, October 26. Instead, we have created a color-coded page of TV listings in our Arts & Entertainment section. We are also offering subscribers a discount subscription to TV Guide. Find out more about the special TV Guide offer for Globe readers.